TWENTY-FIVE POLICE officers have been sentenced to life in prison in Brazil today for their role in the 1992 Carandiru prison massacre that left 111 prisoners dead. Each officer was sentenced to 624 years for using deadly force to quell a fight among inmates. The court found the officers guilty of killing 52 prisoners. A seven-person jury reached the sentence, which was read out by the presiding judge early today. The sentence was reached after a week-long trial, the second part of a process broken into four in which 79 military police officers are on trial for the death of the Carandiru prisoners. The case was brought to trial in April after more than two decades of procedural delays. 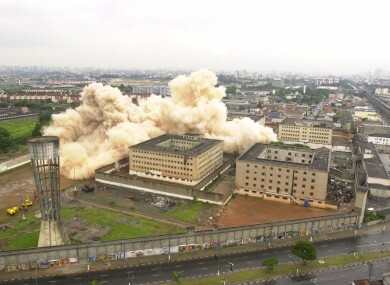 Each trial segment focuses on the deaths that took place on each of the four floors of the prison in Sao Paulo on October 2, 1992. Prosecutors argue that the inmates were executed, while the defence claims the police officers were being threatened and fired in self-defence. 87 prisoners were wounded in the fracas, but the police were unharmed. In the first phase of the trial, 23 police officers were found guilty and sentenced to 153 years prison for the deaths of 13 inmates. The only person previously tried for the massacre was the commander, Colonel Ubiratan Guimaraes, who was sentenced in 2001 to 632 years prison. Guimaraes, a former state deputy, appealed the sentence and was absolved. He was found in 2006 shot dead in his Sao Paulo apartment. Email “Brazilian police officers sentenced to life over 1992 prison massacre”. Feedback on “Brazilian police officers sentenced to life over 1992 prison massacre”.